Well, it’s the time of year again folks where I whip out the chef hat and go to work. 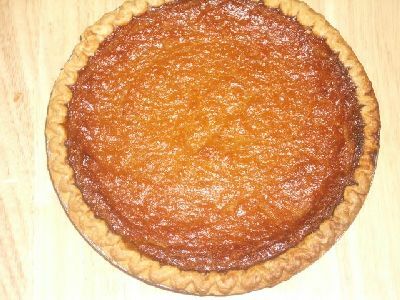 I mentioned in previous blogs about my love for baking sweet potato pies. I've been shocked at them number of emails that I’ve received inquiring about my recipe. Now, a good number of you have used the blog search function and located the blog and recipe that I posted about a year ago. The rest of the folks just want me to make things easier for them. So I’ll be nice and do it… this time. I changed up a few things on the recipe that I experimented with, but nothing major. I found the texture of the pie was better with the small changes. I added a few more eggs and cut back on the butter/margarine slightly. 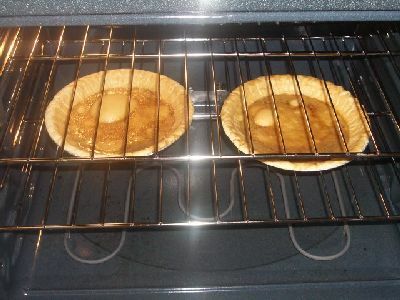 Also, the info on how to do the pie crusts was left out last year, so I included that as well. I baked a few already last week, but I’ll definitely be in the kitchen for a good part of the next week hooking up more pies. Ladies, don’t be afraid to tell your family and friends that you got this recipe from a man. Brothas can work it out in the kitchen as well. Fellas who shy away from the kitchen, go on and give this one a shot. Trust me when I tell ya, you might earn some cool points if you follow the instructions as I’ve listed. Regardless whether male or female, you’re gonna have folks trying to get at you to find out the recipe for this one. I can honestly say that I’ve never had one person complain or give me a bad review on this. 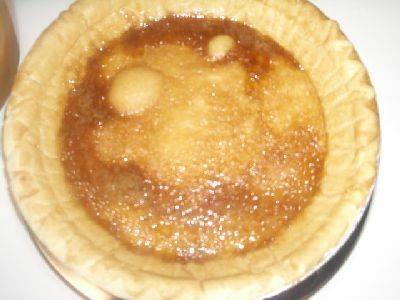 In fact, I have plenty of testimonials over the past few years from those who’ve made pies from this recipe and loved it. This has always been a hobby of mine. 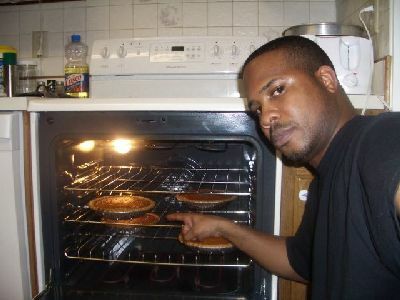 I used to only make pies for myself and that was it. It wasn't until I brought a pie to work for one of those holiday potlucks that I realized that other people really enjoyed them too. It was actually a chef at the hotel I was engineering at, who told me I could make money selling them. He was right, I've done pretty well the past 5 years. But I'm not a stingy person and can't make all the pies. So I figured I'd share. Anyway, here it is again. First off, you must boil the potatoes. I didn't mention that before because it seemed like a no-brainer, but everyone wasn't able to decipher the fact that this is the FIRST step. After the potatoes are cooked and you've peeled them, throw them in a bowl and mixed them up, then you go ahead to the next step. Pre-heat cha oven to like 400-425 degrees. 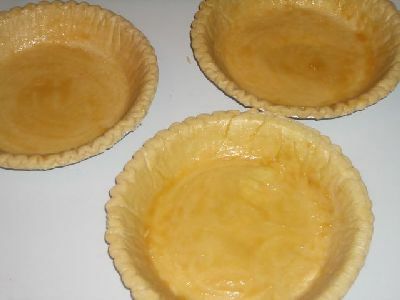 Pie crust preparation: take 1/2 cup of brown sugar and stick of margarine/butter and microwave together... layer the pie shell with the melted brown sugary mix and place in oven for 10 minutes at 350 or until crust browns. Do not worry about the crust bubbling, it’s going to do that. Whatever you do, do not pop it!!!!! Mix the sweet potatoes, milk, sugars, cinnamon, nutmeg, eggs, butter/margarine, vanilla, liquor and lemon juice until it gets real smooth. 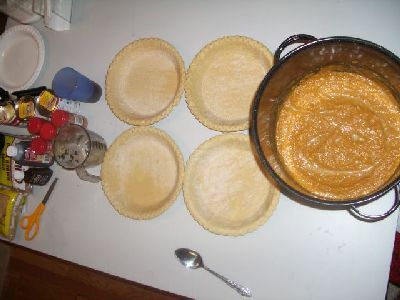 Then pour it into the pie shell. 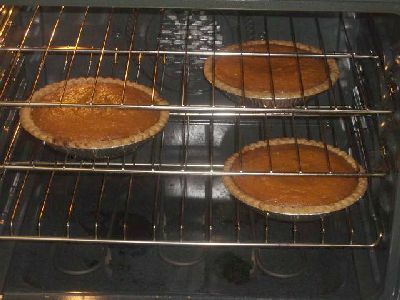 Bake for about 15 minutes at 400-425, then reduce heat to 300 and bake for about 45 minutes or until the filling is firm. Grab some Cool Whip, vanilla ice cream or whatever you like to add and get'cha eat on!!!! G. Mo...wanna get married? Not today...or even this year...probably not in a couple of years. We can have a 10 year engagement...and then when I think about getting married fa serious....it's me and you ...and the sweet potato pies of course! Is that MY pie in the oven? you should uh post your strawberry daiquiri recipe too! 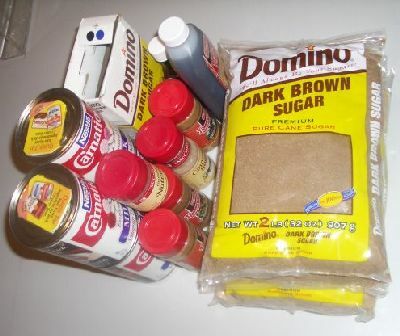 im going to attempt your pie recipe this year!! and i'm cooking thanksgiving dinner this year too? SHEEEEET! i'm using this recipe. thank you thank you thank you! Okay at first when I started reading this I was doing my *what chu talkin bout* look. But then as I read, I could see why your pies are so yummy. 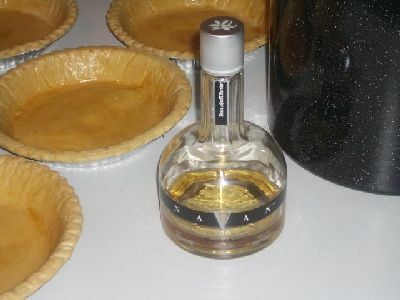 I've NEVER thought to add the rum or vanilla cognac AND with the trick of the brown sugar butter crust. Wow! Okay I'ma email your blog to my girlfriend cuz we try recipes together (since she's in Boston and I'm in The Bay Area of Cali) we kinda do it over the phone. So your will be our November recipe. Thanks bro!!! I can't bake.. but I might have to forward this post to my sister for Thanksgiving. Looks great. I hope you didn't mind me posting this on my blog. I HAD to give you your props! damn what I gotta do to get a vegan recipe?! 1st how long do you boil the SPs? is this a recipe for 1 pie? and how many SPs makes 2 cups? How much is your pie? When do order's have to be placed? I can't bake nor really cook. So my family is safe from my attempts, LOL. Hope you and yours have a Happy Thanksgiving!! @ Blah Blah Blah – No problem. I don’t mind sharing my recipe. 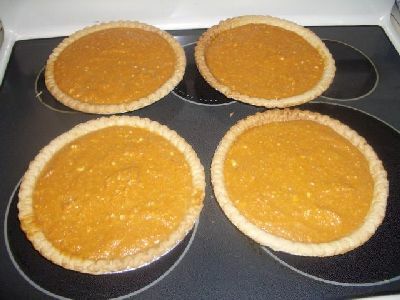 I can’t make all the pies. I appreciate the offer of marriage but… I don’t think my fiancée would like that too much. Holidays are a time for peace and love… I’d like to keep the harmony in my home. @ 1969 – Hmmm…. It could be. Then again, the Giants will see my Cowboys again next Sunday. Wanna go double or nothin’??? @ Spelangel – Sorry, the recipe for the daiquiri is under wraps. @ TC, Nikki (Indigo), Aly Cat 121 - Did you try it out? If so, how’d you like it? @ T. Cas – Maaaaaaaaan… it’s easy. You should go ahead and give it a shot. @ Nikki – No problem on posting it to your blog. At least I know that some folks aren’t taking credit and acting like it’s their recipe… lol. @ BluJewel – What’d I tell ya? I don’t lie on my baking skills. Glad you overcame your nervousness and enjoyed it. @ The Stiltwalker – Vegan recipe? I can’t even imagine how to craft something of that nature. @ KnowOne – That’s a lot of questions. 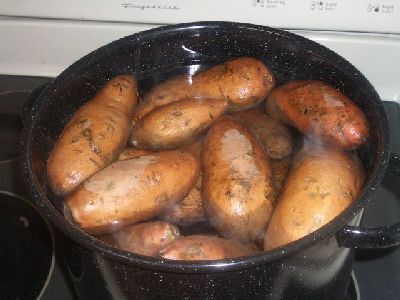 Boil the potatoes until they’re soft. The timing all depends on the temp and size of your pots. Generally I charge about $12 per pie. Naw, I don’t deliver… unless a ‘moderate’ fee is negotiated. I generally just meet folks at a neutral location in the DC area. You can order anytime and I make them year round, so it’s never too late. @ Bklyn Diva – Now that’s a fair trade. I love me some curried chicken!!!! @ A woman on the move – Thanks. They taste slammin’ too!!!! Hope you had a wonderful Thanksgiving. Hope you had a wonderful holiday..nice meeting you at TTD and GTL's party!! i am (albet self titled) the resident foodie and recipe tester. i've been searching fora good pie to add to my blog. good, bad or indifferent, i will let you know the results. you get extra points off breaks for the photos. It doesn't look like many people have posted lately but I sure hope G. Mo periodically visits the site. I stumbled across this blog and recipe this week and decided to try it out. I usually don't like trying new recipes during the holidays because it might not taste good; but after seeing the Navan cognac as an ingredient, I had to. I got up this morning around 6AM and made my first batch! Here what I said... MY FIRST BATCH! I made a few mini pies and of course I had one for breakfast. THIS IS THE BOMB!! I can't wait for my family and friends to taste it. 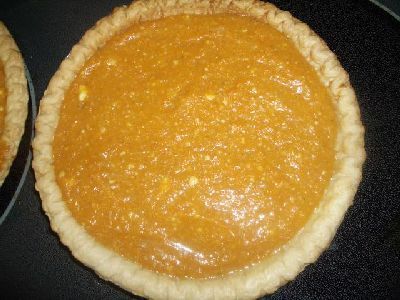 I'm getting ready to make my next batch because I know once they taste this pie they are going to want more! DELICIOUS!! OUTSTANDING!! Great recipe!!! Thanks!